The poster for UFC Fight Night: Cejudo vs. Dillashaw. 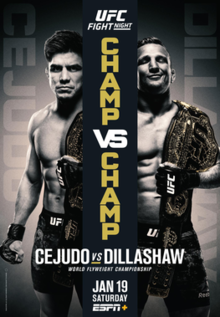 UFC Fight Night: Cejudo vs. Dillashaw (also known as UFC on ESPN+ 1 or UFC Fight Night 143) was a mixed martial arts event produced by the Ultimate Fighting Championship that was held on January 19, 2019 at Barclays Center in Brooklyn, New York, United States. The event was the first one as part of the promotion's five year contract with ESPN and the first to be broadcast on the network's digital streaming platform ESPN+. It generated 525,000 new subscribers to the service on the day of the event alone. Cejudo (left) is the first Olympic champion to become a UFC champion. Meanwhile, Dillashaw (right) the first challenger in a champion vs. champion bout to drop a division. A UFC Flyweight Championship bout between 2008 Olympic gold medalist in freestyle wrestling and current champion Henry Cejudo and current two-time UFC Bantamweight Champion T.J. Dillashaw headlined this event. If successful, Dillashaw would become the third man to be champion in two divisions simultaneously and fourth fighter overall (after Conor McGregor at UFC 205, Daniel Cormier at UFC 226 and Amanda Nunes at UFC 232), as well as the seventh person overall to win a title in different divisions. This was the fifth time in UFC history that champions in different divisions fought for the same title, following UFC 94, UFC 205, UFC 226 and UFC 232. According to sources, the promotion is expected to dissolve the flyweight division at some point within 2019. The pairing was initially expected to take place at UFC 233 a week later, but was moved on December 5. A women's flyweight bout between Rachael Ostovich and Paige VanZant was originally canceled on November 20 due to Ostovich being assaulted by her husband, resulting in a broken orbital bone. However after getting a second opinion from a doctor, though, Ostovich got the green light to stay in the bout. After announcing that former NFL player Greg Hardy would make his UFC debut at this event, the decision to put him on the same card as Ostovich was met with backlash by many people as Hardy was found guilty of assaulting an ex-girlfriend, and sentenced to 18 months probation as well as being suspended for 10 games by the NFL. The charges and suspension were later dropped after the victim failed to appear in court to testify, but Hardy's arrest and trial were the focus of considerable controversy. UFC president Dana White later claimed that Ostovich was "totally cool" with Hardy on the same card as her. A women's flyweight bout between KSW Women's Flyweight Champion and promotional newcomer Ariane Lipski and Joanne Calderwood was initially scheduled for UFC 233. However, it was reported on December 2 that the bout had been rescheduled for this event instead. As a result of the cancellation of UFC 233, a flyweight bout between former UFC Flyweight Championship challenger Joseph Benavidez and Deiveson Figueiredo was briefly linked to this event. However the following day, the promotion clarified plans indicating that the pairing was off and that Benavidez would be an alternate for the headliner bout in the event that either Cejudo or Dillashaw would be forced from the main event. Later it was announced that despite still being an alternate, Benavidez would face Dustin Ortiz in a rematch of his unanimous decision win at UFC Fight Night: Edgar vs. Swanson in November 2014. A bantamweight bout between Thomas Almeida and Cory Sandhagen was briefly linked to the event. However on December 22, it was announced that Sandhagen would face John Lineker in the event instead. On January 10, Lineker was forced to withdraw from the bout due to a rib injury. He was replaced by promotional newcomer Mario Bautista. Ion Cuțelaba was expected to face former UFC Light Heavyweight Championship challenger Glover Teixeira at this event. However on January 10, it was reported that Cuțelaba was forced out of the bout due to injury. He was replaced by Karl Roberson. Randy Brown was expected to face Chance Rencountre, but pulled out in the week leading up to the event. Dwight Grant was soon announced as his replacement, but it was later reported that he was unable to be cleared to fight due to an "eye issue". Promotional newcomer Kyle Stewart was then announced as Rencountre's new opponent. On March 20, it was announced that Dillashaw was suspended one-year due to a failed drug test in relation to this event and therefore he decided to vacate his title. He initially received a one year suspension by the New York State Athletic Commission (NYSAC) retroactive to the event's date. On April 9, Dillashaw accepted a two-year suspension by USADA, retroactive to January 19, as it was revealed he tested positive to erythropoietin in a fight night test. ^ a b Staff (2019-01-20). "UFC on ESPN+ 1 draws announced 12,152 for $1.23 million live gate in Brooklyn". mmajunkie.com. Retrieved 2019-01-21. ^ a b Staff (2018-11-04). "UFC announces 2019 first quarter schedule: ESPN debut Jan. 19 in Brooklyn". mmajunkie.com. Retrieved 2018-11-04. ^ ESPN Newswire (2018-05-23). "ESPN to broadcast 30 UFC events per year during 5-year deal". espn.com. Retrieved 2018-09-05. ^ Mookie Alexander (2019-01-21). "UFC's ESPN+ debut pulls in 525,000 new subscribers on Saturday night". bloodyelbow.com. Retrieved 2019-01-22. ^ Tristen Critchfield (2018-12-05). "Henry Cejudo vs. T.J. Dillashaw moved from UFC 233 to headline UFC debut on ESPN+". sherdog.com. Retrieved 2018-12-06. ^ Mookie Alexander (2018-11-07). "UFC will dissolve men's flyweight division, likely by end of 2018". bloodyelbow.com. Retrieved 2018-11-07. ^ Staff (2018-11-26). "Henry Cejudo vs. T.J. Dillashaw flyweight title fight official for UFC 233 in Anaheim". mmajunkie.com. Retrieved 2018-11-27. ^ Damon Martin (2018-11-20). "Rachael Ostovich ruled out of her fight against Paige VanZant". mmanytt.com. Retrieved 2018-11-20. ^ Staff (2018-11-27). "Second opinion for Rachael Ostovich puts fight with Paige VanZant back on at UFC on ESPN+ 1". mmajunkie.com. Retrieved 2018-11-29. ^ Jim Bradley (2014-07-14). "Panthers' Greg Hardy found guilty on 2 counts of domestic violence". wsoctv.com. Retrieved 2018-12-07. ^ Mike Chiappetta (2018-12-06). "UFC shows spectacular misjudgment placing Greg Hardy on same card as Rachael Ostovich". mmafighting.com. Retrieved 2018-12-06. ^ Tristen Critchfield (2018-12-05). "Greg Hardy to share card with Rachael Ostovich for UFC debut in Brooklyn on Jan. 19". sherdog.com. Retrieved 2018-12-05. ^ Staff (2015-02-09). "Panthers: No change in Greg Hardy status after charges dismissed". wbtv.com. Retrieved 2018-12-06. ^ Steven Marrocco (2018-12-06). "Dana White: Rachael Ostovich 'totally cool' with Greg Hardy on same card at UFC on ESPN+ 1". mmajunkie.com. Retrieved 2018-12-06. ^ Ariel Helwani (2018-11-08). "Joanne Calderwood-Ariane Lipski flyweight fight added to UFC 233". espn.com. Retrieved 2018-12-03. ^ Drake Riggs (2018-12-03). "Ariane Lipski vs Joanne Calderwood moved from UFC 233 to UFC Brooklyn". bjpenn.com. Retrieved 2018-12-03. ^ a b Thomas Gerbasi (2018-12-13). "2019 fight updates". ufc.com. Retrieved 2018-12-13. ^ Staff (2018-12-13). "Joseph Benavidez named Cejudo-Dillashaw backup for UFC on ESPN+ 1; fight vs. Figueiredo off". mmajunkie.com. Retrieved 2018-12-13. ^ Staff (2018-12-15). "Joseph Benavidez gets UFC on ESPN+ 1 fight after all, rematches Dustin Ortiz". mmajunkie.com. ^ Ariel Helwani (2018-12-22). "Sources: Lineker-Sandhagen in works for Jan. 19". espn.com. Retrieved 2018-12-29. ^ Jay Pettry (2019-01-10). "John Lineker out of bout with Cory Sandhagen at UFC on ESPN". sherdog.com. Retrieved 2019-01-10. ^ Staff (2019-01-12). "Report: Mario Bautista in for John Lineker, meets Cory Sandhagen at UFC Brooklyn". mmajunkie.com. Retrieved 2019-01-12. ^ Alexander K. Lee (2019-01-11). "Karl Roberson steps in to fight Glover Teixeira at UFC Brooklyn". mmafighting.com. Retrieved 2019-01-11. ^ Staff (2019-01-13). "Dwight Grant not cleared as replacement for UFC on ESPN+ 1 (UPDATED)". mmajunkie.com. Retrieved 2019-01-14. ^ Staff (2019-01-14). "Kyle Stewart in for Dwight Grant, meets Chance Rencountre at UFC Brooklyn". mmajunkie.com. Retrieved 2019-01-14. ^ "UFC Fight Night: Cejudo vs. Dillashaw". Ultimate Fighting Championship. Retrieved 2018-11-06. ^ Tristen Critchfield (2019-01-19). "UFC Brooklyn bonuses: Donald Cerrone pockets $100K in successful lightweight return". sherdog.com. Retrieved 2019-01-19. ^ Nick Baldwin (2019-04-10). "T.J. Dillashaw suspended for failed drug test, relinquishes UFC bantamweight title". bloodyelbow.com. Retrieved 2019-03-20. ^ Ariel Helwani (2019-03-20). "Dillashaw gives up belt, suspended by NYSAC". espn.com. Retrieved 2019-04-11. ^ Steven Marrocco (2019-04-10). "T.J. Dillashaw accepts two-year suspension from USADA after positive drug test". mmajunkie.com. Retrieved 2019-04-09.